Get to know our team and then come in to meet us! Our doctors! This group really sets the scene for everything that goes on here at the dental office. They are dedicated to learning and providing the best patient care possible. They are also looking into the latest dental technologies to see how we could improve your treatment. You are in the best of hands with our doctors. I graduated from Marquette School of Dentistry in 1973. I have been a member of the Academy of General Dentistry since 1980 and received its prestigious Fellowship award in 1992. I am also a member of the American Dental Association, Wisconsin Dental Association, the American Orthodontic Society, the International Association for Orthodontics, the American Academy of Dental Sleep Medicine and the World Clinical Laser Institute. When I’m not in the office, I enjoy spending time with my wife, Julie. Whether we are traveling or just spending time with our kids or grandkids, we have a good time. I am proud of what Grand Avenue Dental Care has become and I look forward to continuing to give our patients the best in treatment and customer service as we further strengthen our mission of Sharing Smiles … our patients are the best!! I graduated from The University of Iowa College of Dentistry and Dental Clinics, where I earned my DDS degree in 2017. I am a member of the Wisconsin Dental Association and the Academy of General Dentistry. In my spare time, I enjoy spending time with my family, friends, and fiancé, Dr. Patrick Clancy, who is also a dentist. I also enjoy spending time outdoors, checking out local restaurants, cooking, and reading. Since beginning at Grand Avenue Dental Care, I have loved getting to meet and care for so many wonderful patients. I love being part of this tight-knit team that provides outstanding service to help our patients have healthier and happier smiles! I graduated from Marquette University School of Dentistry in 2014. I am a member of the American Dental Association, Wisconsin Dental Association and the Greater Milwaukee Dental Association. Away from the office, I enjoy spending time with my husband and son, and our friends and family. Spending time in the great outdoors, traveling to new destinations and reading a good book are all things I enjoy in my free time. As your dentist, my goal is to provide you the best possible care, in a relaxed and stress-free environment. I’m excited to be part of the Grand Avenue Dental Care team, as we value our patients and are constantly working on how to improve your patient experience. Our hygienists! We sometimes refer to them as the 'Teeth Geeks' because they truly 'geek-out' over all things teeth cleaning. These pros are dedicated to educating you about your dental health and how you could improve it. They continue to educate themselves about the latest practices and products available to help you get the smile you want. I graduated from MATC in 2008 for dental hygiene and I have been working with Dr. Wilk since then. When I’m not in the office, I enjoy spending my time with family and friends- my son, Max, keeps me moving! I love playing volleyball, cooking, gardening and reading. I also LOVE cleaning teeth and I can’t wait to see you in the office! I graduated from WCTC in 2011, with my associate degree in dental hygiene. Before that, I was Dr. Wilk’s assistant for 11 years. My husband and I live in Kewaskum and have two little girls, Isley and Hazel. Some of my favorite things to do, besides spending time with my family, is going on cruises (to any warm location! ), running outside and taking my daughters shopping for cute clothes. My favorite season is summer and enjoy spending time in the sun and going away for long weekends. I love working for an office that continues to improve and grow and getting to know my patients is always something I enjoy.. I’m happy to be here at Grand Avenue Dental Care! I have been a Dental Hygienist for 25 years, and I continue to love my profession. I have been working at Grand Avenue Dental Care since 2013 and really enjoy the office and the people. I am also a massage therapist and aesthetician and the proud owner of a day spa in Erin, which I LOVE to work at when I’m not here. Cooking, gardening and doing anything outdoors are my favorite free-time activities. Whether at my spa, or here in the office, I love working one on one with people. Being able to educate people on how to care for their teeth and being able to give them a brighter smile is just awesome! Since my freshman year in high school, I’ve wanted to be a dental hygienist. I spent a lot of time in braces, which also meant a lot of time at the dental office and I found the dental field to be very interesting. I graduated from WCTC in 2002 with an Associates Degree in dental hygiene and over the years have had the pleasure to work with a variety of patient demographics and backgrounds. I have lived in Washington county my entire life and have three wonderful kids that keep me very busy! I enjoy watching my kid’s sporting events, traveling, hiking, camping, tennis and golf. I am also engaged and plan to marry in 2019! It is very rewarding to me to be able to ease my patient’s anxiety and to help them to feel better about their smile. I’m very excited to be a part of the GADC team and I love how much the whole team cares about their patients and the community! Our Dental Assistants: Working closely with our doctors, our dental assistants aim to make sure you are comfortable and calm for each of your visits. They are no strangers to continuing education either and they are always ready to answer any questions you might have about your treatment. I have been working for Dr. Wilk since 2009 as his dental assistant and truly enjoy what I do. Easing patient’s anxiety and helping them overcome their concerns is very rewarding. I have always lived in the Washington County area and still reside here with my husband and two sons. I have been a dental assistant since 1999 and have loved working with Dr. Dowden and Dr. Wilk here at Grand Avenue Dental Care. My husband Dave and I have two amazing kids: Allison, who loves horses, playing volleyball, and babysitting, and Jacob, who loves baseball, basketball and doing anything a boy is supposed to do. I love to spend my time with my family and friends, I enjoy reading, and watching my kids in all their activities. The most rewarding part of my job is when a patient comes in very apprehensive about their visit and leaves with a smile! 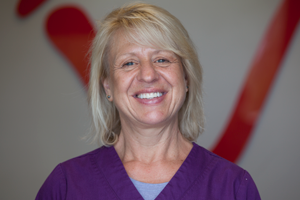 I was born and raised in Hartford, and have been working at Grand Avenue Dental Care since 2016 as a dental assistant. As a child, I loved going to the dentist, and knew that I wanted to do something in the medical or dental field and be able to help people. Dental assisting was the perfect fit for me and I graduated in 2014 from a dental assisting program in Green Bay. I am so happy to have found Grand Avenue Dental Care because it is close to my home and I feel like it is my second family. I love building relationships with my patients and being able to make them comfortable while educating them on how to take care of their smile. I also enjoy the whole team of people here, and how genuine and caring they are with their patients. When I’m not at the office you can find me outdoors kayaking, walking my dogs, playing volleyball, gardening or spending time with my family and friends. When I was pretty young, I accompanied my mom on a visit to the dentist when she needed to get a root canal. The dentist had to ask me several times to “get out of his light” and from that time on, I knew I wanted to go into the dental field. I began my career as a dental assistant in 2013 and have been loving every minute of it. I am thrilled to have joined the great staff here at Grand Avenue Dental Care. I feel like I’m part of a family here and I love the friendly, positive atmosphere we create for our staff and our patients! When I’m not in the office you can find me spending time with my friends, family and my puppy, usually outdoors. I also enjoy hunting and I am a licensed emergency medical responder. I look forward to Sharing Smiles with our patients for years to come! Our Front Office Staff: Whether you are just arriving to warm smiles and freshly baked cookies, or you are calling to verify some insurance information, our team of front office professionals are here to help! Feel free to ask us any question and if we don't know the answer, we'll find out what it is! I've been a patient coordinator at Grand Avenue Dental Care since 2014. Previously, I've worked in the restaurant and customer service industry which fits because I'm a people person! That means that I love talking with and helping people with anything I can, especially our patients. I have a 5 year old son, who is my whole world and who is in Kindergarten this year. In our free time we enjoy watching WWE wrestling, going for long walks to the park or exploring around town and visiting friends. Music is a large aspect of my life and I love going to John Mayer concerts as often as possible! Fitness and health are also important to me, so I try to keep active during the busy weeks and make healthy meals for my family. I'm extremely happy to work with such kind and good hearted people at Grand Avenue Dental Care and I hope to continue to grow with this practice! I am proud to work at Grand Avenue Dental Care and joined the team in 2017. I was excited and up to the challenge of a new field of work in a dental office and have loved this opportunity. In my free time, I love all things music and art! I enjoy working on new craft projects, teaching clarinet lessons and going to art and music fairs. My husband and I have three children and we enjoy camping together throughout the summer and fall. My favorite part so far about working at Grand Avenue Dental Care is that every day is a new opportunity to help someone and be able to make them smile. I also enjoy the fun co-workers on our team! I have worked in customer service for over eight years and joined the Grand Avenue Dental Care team in 2017. I love being able to work with people every day and getting to know our amazing patients. In my free time I like spending time with my family, fiancé and friends, participating in outdoor summer activities and preparing for and celebrating Christmas - it’s my favorite! I truly enjoy working with the team here at GADC and feeling like I’m part of the family. Learning new things and making the best experience possible for our awesome patients is my favorite part of the job! While attending Moraine Park Technical College to obtain a degree in medical billing and coding, I had found a job in the dental field to help gain some hands-on experience. I discovered that I really enjoyed the dental field and after graduation in 2013, I was happy to find the great team here at Grand Avenue Dental Care. I love being able to combine my knowledge and experience with helping our patients. When I’m out of the office, I enjoy outdoor activities, reading, spending time with my son. I truly enjoy my job and working with the great patients and staff at Grand Avenue Dental Care. I have worked at Grand Avenue Dental Care since 2001. I have an Associates Degree in Accounting and am also a member of the American Association of Dental Office Managers. I am a lifelong resident of Hartford and enjoy baking, traveling, concert-going (Summerfest!!) and spending time with my family. I am also passionate about raising awareness for Alzheimer’s and Cancer and enjoy doing Relay for Life and Alzheimer’s walks. I truly love being able to continually learn and grow here at Grand Avenue Dental Care. It ensures that we are always improving and I love doing that for our patients! I have worked here since 2011, and have loved developing the marketing program for the office. I have a degree in Health Science and several years experience managing guerilla marketing promotions in New York City. When I’m not working, I love spending time with my family. My husband and I have two girls that keep us smiling and busy! I really enjoy coming up with new ways to share our staff and office with more people. My favorite parts of the job are being able to introduce others to Grand Avenue Dental Care and to give back to our patients through things like our referral program- Giving back to our patients is AWESOME.. just like them!